Home > Solar Panels > Got A Shaded Roof? Then don’t buy solar without a Suneye shade analysis. Got A Shaded Roof? Then don’t buy solar without a Suneye shade analysis. Shade is the number one enemy of a high performance solar power system. If your roof has substantial shading between 9am and 3pm then installing solar panels is probably going to be a really bad investment. If you are confident that your roof roof has absolutely no shading, then solar can be a great investment thanks to the current handouts by the Federal and State governments in terms of Solar Rebates and Solar Feed In Tariffs. But what do you do if you suspect that your roof may get only a little shading throughout the day? Most roofs will get some shade from trees, power poles and neighbouring multi storey buildings. How do you definitively work out how much shade your roof gets throughout the whole year? And how do you use this information to get an accurate figure for how much power you can expect from a solar power system on your roof? Because that is the figure you need to make an informed derision as to whether solar panels on your particular roof are going to give you the financial payback that you are looking for. Well, the obvious answer is to get an accredited solar installer round to your house to have a look at your shaded roof and advise you. So how will a reputable solar installer/designer work out the shade on your roof and how this translates to electricity output? …then thank him for his time and throw his business card in the recycling bin. Hopefully he’ll get on your roof and use a specialist instrument to conduct a full “Solar Shade Analysis”. This is usually a camera with a fish eye lens that can amazingly take just 1 picture of the panorama around your roof and then crunch the resulting image data and tell you very accurately when and how much your roof will be in shade at any time of year. So how does it work? What is this magic device? One of the best systems on the market is called the SunEye. The fisheye lens is top left. The installer places it on your roof and presses the button. 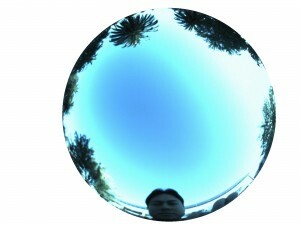 Which shows the obstructions to the sun around the circumference of the fish eye. To read this picture you need to know that 6am starts at the LHS through to 6pm on the RHS. The horizontal lines denote the month of the year, June at the bottom through to December at the top. 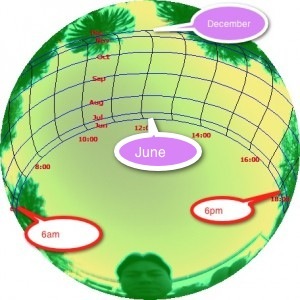 If there is an obstruction inside the hatched area, you can see what time of day the shadow occurs and which month of the year. In a perfect world there will be absolutely no obstructions in the hatched area. The installer will then download this image to his laptop and the software will crunch the data and provide a very accurate estimate of what your power production hit will be due to the shading issues for your roof. 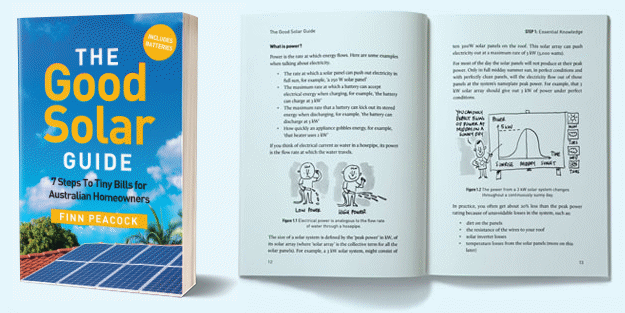 You can then decide if you are happy with the reduction in power from the shading issues on your roof and make a fully informed decision on whether to install Solar Power on your home. If you have any shading at all on your roof and you don’t use a similar method to measure the effect on solar power output, you are just making a “Wild Assed Guess” as to whether your multi thousand dollar investment will give you the returns you are looking for. Finally if you do have minor shading issues, then consider a micro inverter based solar system. Whilst micro inverters are not a magic bullet for shade issues, they can stop minor shading issues from becoming major power killers. Finn, this is a really useful and interesting article – thankyou. I wonder if the bottom line should be labelled “June” rather than January, as presumably the line the sun takes ‘peaks’ in December, then starts to track back ‘down’ the image. Good Spot! You are 100% correct – I have updated the label. Also be aware that the diagram is for the Northern Hemisphere so their summer is June, hence a higher sun and less shading in June. How about one for the southern hemisphere.?? That would be excellent. This instrument is 100% compatible here in the Southern Hemisphere, but the only screenshot I could find was from the US! Fantastic info Finn! I am looking to go Solar and have started looking around for the best deals. My only concern is that my roof faces East/West with a pitch of 15%. Am I wasting my time? 15 degrees pitch is fine for solar. If you don’t have North facing roof space, be prepared to lose about 15% of your power (no big deal with current low panel prices). Put your panels on the west facing roof and you’ll get more solar energy during the “peak electricity pricing hours”. You’ll be happy you did if you ever get put on a “Time of use” electricity tariff where electricity is much more expensive to use between 2pm and 5pm! This is interesting as I realise that I have some shading from trees in the council parkland next door which impacts on the north facing roof where I thought it was completely sunny all day. In fact I have really been taking a good look at the roof just lately at different times of the day and half of it is shaded from 1- 2 pm onwards. Doesn’t look good! I have had two quotes done recently through your site but no one used this device so I am unsure about going ahead with the solar now. I have been doing more reading on the impact of shade on the solar panels and the more I read the more I am unsure about going solar. It might be a waste of money for me. How do I find out who does use these devices when quoting? Glad I stumbled across your blog. Great stuff! I installed solar about a year ago. I live on acreage but have tall trees. I knew I was going to cop some shade due to some very tall trees on my property. I can see some big holes in the output during the day and would now like to trim some of the trees causing this. In order to instruct the tree-lopper properly I need to identify the offending trees and it sounds like a device like the Sun Eye is needed. Would that also serve to identify the trees that are causing the problem? I live in the Sunshine Coast (QLD) hinterland and wondered if you knew of anyone over this way that could carry out such a survey. Another suggestion I was given was to contact an architect for a shade pattern study. I can have the Suneye sent to you, but I will mention it can only tell you about existing shade and won’t be able to tell you what should be trimmed to improve the situation. I have two quotes thanks to you. However one company says I need panels to be tilted ,the other saying that they can be laid flat.My roof faces west and has 22 degree pitch. Witch one would you suggest if any Confused. You would get slightly more power if you tilted your panels (especially if they were tilted to face north), but you do not need frames if you have a 22 degree west facing roof. Whilst the perfect pitch for Victoria is 37 degrees – the extra power you would get by going to the expense of putting all your panels on tilt racks would be tiny compared to the cost of the racks. It would be much cheaper to make up for the “lost” power by adding a solar panel for $300 or so rather than spending $1000’s on a tilt frame. While I’m sure it is not as good as the Sun Eye there is a great app on the Google Store called Solar Shading by Comoving Magnetics. It is $16, but worked really well on my Samsung S4. It worked out I would lose 17%. Without it – who would have known what my loss would be. Okay, it seems that my post is late but anyway better late then never. If you look for help in shading analysis you can just youse your Android phone and free non-commercial ScanTheSun app. I have invented ScanTheSun as non-commercial scientific contribution and I hope it will be helpful to some of you. I have a question regarding splitting panels. If panels are placed on my North facing roof and the rest are place on my North/West facing roof what effect will this have on the current generated once the sun descends below the ridge of the North panels and is only feeding the North /west panels ? Also is it possible to mix inverters. Say for instance to have micro inverters on the North panel and a normal Inverter on the North/West panels or should all the panels have micro inverters ? In theory, yes you can mix micros and DC on the same roof. You’d need separate cables down from the roof for the micros and the DC inverters. Yes – I’ll post it to you as soon as I’m back from Easter camping trip! I was wondering if I could have a lend of your Suneye – I’m involved with a project that will require solar power at 4 sites – all in Forestry Corporation NSW areas, so shade issues are significant. To get a highly accurate picture of the effects of shade it is important to use a Suneye or similar device. But you probably already have a good idea whether or not your roof has serious shade issues. If there are no shadows on your roof past early morning or before late afternoon, then it’s not a large problem. But if there are shadows on your roof for a significant part of the day I would insist on a shade analysis so you can know if installing solar is worthwhile for you. I believe Finn still has a SunEye that he can lend out, so if you want to borrow it I can let him know. You will need someone who can safely go on your roof to use it. Fantastic site, congratulations. Like others I am having trouble finding someone able to do a proper shade analysis – do you know of anyone in the 7277 vicinity? Sorry – I don’t – it drives me crazy that most installers don’t have a sun eye! However! I do have a sun eye that I post out to people who want to do their own analysis. Let me know if you want to borrow it. That’s real positive, I’ve been reading this feed with interest, I work in the industry and want an edge, i think presenting this data in a professional way will win jobs. Just got a question on how to take the shot when up on the roof, do you just put it on the north facing orientation in the middle of the roof and take the shot? This is understandable if you only have a north facing aspect with panels. What happens if you are thinking of using 2-3 orientations for panels. I’ve just received about 6 quotes from various installers including some from solar quote. All of them picked up that there would be “some” shading but still wanted to put a PV system in and all gave me the standard PV production table (with the inevitable proviso that it was subject to any and all conditions for my roof and probably wouldn’t perform to the stated levels). The performance hit varied from negligible to 10%, but they were all WAGs using NearMap. Ok, I expected a hit of some sort for some of the day. Then I got a guy who called and said, “I’ve had a look at your roof and there’s no point me coming out. I could put panels up, but you won’t see much power and it will be lucky to pay for itself in under 25 years!”. Apparently, he had some photos form NearMap that indicated that most of the roof was covered by shade for most of the day for most of the year! He estimated only 3-4 months of the year would panels not be under any shade at all and said that even a 3-5% coverage by shade could cost 25-30% of power output and if it got as high as 10-15% then the panel produced next to nothing. So now I’m wondering who to believe. They all used NearMap, some say there’s a negligible problem and then there’s this one guy who says it would be a complete waste of money but this is all qualitative. None of them can provide any quantitative analysis on what will really happen and if it’s not worth the money. I’m in the 3172 postcode, do you know anyone who can come out and do this properly and give me firm numbers on what is really going on?